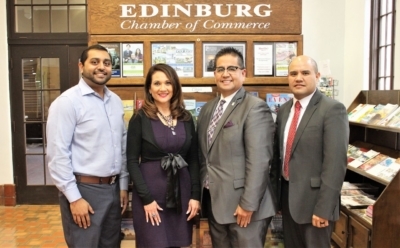 Edinburg of Commerce officials Hiren Govind, Mario Lizcano, Veronica Gonzalez and Ronnie Larralde promoting the RGV Census Forum. The Edinburg Chamber of Commerce’s Feb. 7 Public Affairs Luncheon will host several county judges as they discuss the 2020 census. The RGV Census Forum will feature Cameron County Judge Eddie Trevino Jr., Hidalgo County Judge Richard Cortez, Starr County Judge Eloy Vera and Willacy County Judge Aurelio “Keter” Guerra. The U.S. Census counts every resident in the United States, as mandated by Article I, Section 2 of the Constitution. The data collected by the decennial census determine the number of seats each state has in the U.S. House of Representatives and is also used to distribute billions in federal funds to local communities. The luncheon will take place at Edinburg Conference Center at Renaissance, 118 Paseo Del Prado, from 11:30 a.m. – 1 p.m. Cost to attend the luncheon is $25 per person, Chamber members may purchase a table for eight at $250, Non-member table rates are $300. Admission includes a hot lunch, beverage and dessert. For more information on sponsorships or to make a reservation, call the Edinburg Chamber of Commerce at 956-383-4974.